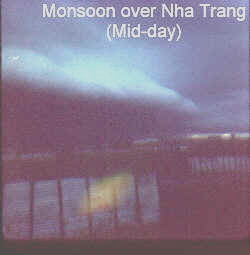 Until I got to Vietnam and saw my first monsoon, I had no idea just how bad a rainstorm could be. Rainstorm doesn't even come close, how about end-of-time judgment storm. In any case, during the monsoon season the monsoon clouds would come into our base in Nha Trang every afternoon at about the same time and many times would stall out just at the edge of the base. The rain at times would be so thick that I swear you couldn't see into it more than 10 feet. The clouds would be so full of water and so dark that it literally turned day into night. I guess it was the ocean currents that kept the rain just on the other side of the gate. Many times I watched in amazement as it poured the rain just feet from me while I stood in sunshine. I often wonder just how high those dark clouds were and how could they hold that much water. Woe to the pilot that was unfortunate enough to get caught in one. On one occasion, I almost found out for myself. My mission that day was to fly a major and his party to a montagnard (Mountain Yards = English version, “yards” for short) outpost that was deep in the mountain jungle between Nha Trang and Ban Me Thuot. The ship I was flying was needed in an assault scheduled for the next morning and I was told I’d better not get weathered in or it would be my A_ _ if that ship was not there in the morning. Finding the village was easy but I sure did not like the arrangement there. The outpost was atop a very small hill at the bottom of an extremely steep valley. A small road ran to the side of it. The ship had adequate room to set down even though the outpost was only about 100’ by 150’. A solid tree line surrounded the outpost. The ship was at one end of the outpost. Then there was a small clear area, and at the far end was a line of little hooches that helped form the perimeter. To our immediate right was a special meeting area with a very long table and lots of chairs. Everything was so tight that a sniper with only a 22 pistol could have killed anyone he wanted in that outpost. Apparently, the area “yard chiefs” were there for a meeting with the major and his staff. Already there, were several other American military personel. I stayed with the ship and had it in combat ready mode so we could be up and out of there in 60 seconds if needed. The Americans went to a lot of trouble to honor the chiefs that were there for the meeting. I’d say there were probably a dozen or so of them. They sure walked with pride in their loin cloths and suit coats. It wasn't very long before the meeting left the hooch area and people were directed to the long table. One of the major's party came over and told us that we, meaning the crew, were to take part in a “yard” feast and that we were to sit at the end of the table nearest the ship. Apparently the table was set up according to rank. With only “C” rations on board the feast sounded pretty good and we all went over to the table. After we all were seated, a short speech and toast were made and the women started bringing out long aluminum trays that had a variety of food on them. We were given warm Saigon cokes to drink and I wondered how they got them way out here. There was some sort of meat on the tray and a good variety of other things. I did recognize the rice and peas. As we started to eat it became very evident to all the Americans that the meat took forever to chew. Apparently this was anticipated because one of the major's people looked at us and said “roe deer”. Roe deer or not, we all knew that dog was considered a delicacy in all of Vietnam and this meat was as hard to cut as it was to chew. Didn't take the crew long to figure that one out, and all 3 of them asked to bail out of the meal. Guess the Lord knew what was about to happen and gave us an out with the approach of the monsoon clouds up the valley a ways. Knowing I could eat just about anything and some of the stuff on the tray did look interesting I told the major's man my crew won't eat any of that but I could. I then asked if it was OK for them to go back to the ship, using the pending rain as an excuse and for me to stay? He was OK with that. With the meal over I returned to the ship with a definite eye on the dark clouds coming quickly our way. A comment was made concerning how I could eat that stuff and still fly and it was taken in stride. In the crew's eyes I guess I should have gotten some kind of medal for that. As time went by the approaching monsoon clouds let us know of its veracity with a continuous thundering echo that came down the valley. The major's schedule was going to have to be cut short and I went over to the major's man and told him we only had about 10 minutes time left. I also reminded him of the fact that I had to have the ship back that day and could not stay the night there or fly in that stuff. He said OK and promptly told the major. The wall of rain was almost on us and the people in the outpost were scurrying to secure everything they could and to find a dry place to stay. With the first drops of rain on the windshield I told the PP to start the ship. The major looked at us and held up a hand full of fingers. 5 minutes, yea sure. I immediately sent the CE over to tell him that we had to leave now. The major sent him back, looked at me with a smile and held up 5 fingers again. Three things then happened within seconds of each other: the CE secured himself in his seat, the rain hit the hooches and I pulled pitch. I was now between the proverbial “ rock and a hard spot”. That flight back sure was quiet. It's not often a mear warrant officer leaves a major stranded. All I knew was that I’d rather have a stranger major mad at me then my own Ops officer. After we got back and secured things I went straight to Ops and told them what had happened. The Ops officer didn't say much but I do remember some of the EM there turning in their chairs to look at me. I didn't know if they thought of me as some kind of hero or someone just about to get sent to Ft. Leavenworth for 20 years. I was a little scared. The OPS officer let me linger a while and just stared at me without saying a word. I was then dismissed and went about my business. About a month later the OPS officer spotted me and told me that the major had again requested a ship from us for a similar mission and he told him to get one from another unit, all ours were committed. Now a little about the "Yards". The technical name for the jungle people that were scattered throughout the highlands of Vietnam is "Montagnard" but we simply called them "Mountain Yards" or just plain "Yards". They were bow & arrow people that wore little clothing and just wanted to be left alone to hunt the animals of the jungle. I felt sorry for them because they took it on the chin and then some by the NVA. 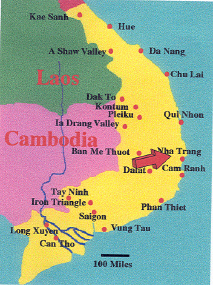 It was our understanding that the NVA would come into their villages and not only take food but women and children as well, to be used as camp slaves. The military would try to help them the best they could from time to time in exchange for NVA movement information as was my understanding. The mission to fly the "Yards" flight came around about once every 2 months for me. It sure was a mission I looked forward to because of the scenery that went by. Trying to find the many outposts, that were scattered all over the highlands, was definitely a challenge. The mission was usually a single shipper or two at the most. We would bring them supplies that consisted of mostly weapons (old ones), food, uniforms etc. I don't think I ever flew that mission when the weather was good. It made me kind of feel like I was taking part in some kind of "National Geographic" special. As soon as we would land it seemed that the whole village would come out to look at us. I couldn't help wondering what they thought of us with all our technology. They were very friendly people and didn't mind us taking pictures of them at all. The kids would wait eagerly for the men of the tribe to unload the supplies then head into their little fort for a conference with the people we brought along. When the men were gone the kids would surround the ship and would touch this and that. We didn't mind at all. We had the run of the village and often times I would peek into some of the long huts that they had. We would be there an hour or so as I recall and after the first 15 minutes the people usually went back to their daily routine. On one trip I remember watching as a lone hunter came out of the woods with a very large lizard that was over 4' long. Somebody in the village spotted him and he was immediately surrounded by a pack of kids. He let them have the lizard and began jabbering away as the group headed into camp. I imagine he was telling them the story of how he got it. Because of the ruckus, I believe the lizard was a prized item. That guy sure walked with pride among all those kids. I also remember seeing a man come in with a couple of monkeys and giving them to one of the ladies of the tribe. She immediately began skinning one. I wonder what monkey taste like cooked their way. I got to peek into one of their long huts but never got a picture because I would have had to have a flash because it was so dark inside. There were several small fires that were held to just coals and it appeared that each family unit had a fire. There were no walls so living was communal style. On one occasion the 281st got the call for an emergency evacuation of an entire "Yard" village. It had to be done on very short notice and as I recall the mission lasted to dark thirty. Everything except the fires and the buildings were moved to a new area. Squealing pigs were carried on in bamboo cages and I'm told the constant squealing would just about drive one crazy. The chickens didn't like the ride either. They also somehow brought their livestock with them I believe. There were complaints from the crew members about the smell also and how long it would take to clean the ships up again. For that story click HERE. As I mentioned before, the diversity of missions that we had sure kept things interesting. As pilots, of mostly the lower ranks, we saw everything as it actually was. Nothing was sugar coated. There was no PR man giving us a spiel or spin as they now call it in order to justify something. As they say, "You can't really appreciate the good until you have seen the bad". I sometimes wonder what happened to those folks after we pulled out. I hope they returned to their life style with little intervention by the government. I wonder too if the little boy pictured here grew up to eventually become village chief. I would have to guess that he had a rough time of it until his teens. When his size took over I do believe things would have turned around for him. My regards to a unique people for it was my pleasure to share a moment of their lives and be able to share that experience with others now.